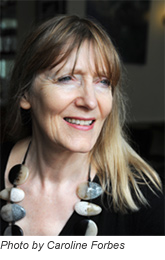 Claire Crowther's poems and reviews have appeared in journals including London Review of Books, Long Poem, New Statesman, PN Review, Poetry Review, Poetry Wales, Shearsman, The Times Literary Supplement and also online at Blackbox Manifold, Molly Bloom, Qualm. Her poems have been widely anthologised including in The Best British Poetry 2013 edited by Ahren Warner (Salt, 2013) and The Best British Poetry 2015 edited by Emily Berry (Salt, 2015). She has published three pamphlets and three full collections and was shortlisted for the Aldeburgh Best First Collection prize. As an undergraduate at Manchester University, she won the Shakespeare Scholarship and the George Gissing Memorial Prize in English Literature. She was awarded a bursary by Kingston University to complete her second book. Claire Crowther was poet in residence at the Royal Mint Museum during 2014-2015. Her resulting pamphlet Bare George was published in June 2016. Her poem 'A Silent Star Among the Hypocrites' was poem of the day on Poetry Daily on October 11th 2014. Ubi Sunt was poem of the week at TLS on May 20-27th 2015. Claire is co-editor on Long Poem Magazine.